U.S. Army Africa officials have said the military organization is helping to train African soldiers to detect and counter improvised explosive devices, Army Times reported Tuesday. Michelle Tan writes U.S.’ African allies asked for assistance from USARAF to carry out IED threat awareness training and mitigation operations as Islamic militant groups increase their use of homemade bombs to conduct attacks across the continent. “The African countries have seen how involved we’ve been in Iraq and Afghanistan and how much we’ve learned… and they’re trying to tap into us and share some of our lessons learned,” Lt. Col. Anthony Barbina, engineer plans and operations chief at USARAF, told the publication. 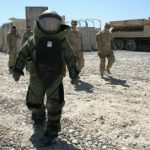 The report said USARAF established a counter-IED fusion cell focused on supporting partner nations of the U.S.
U.S. forces teach African troops how to spot and safely dispose of roadside bombs, perform forensic exams on those devices and disrupt IED networks, according to Tan’s article.